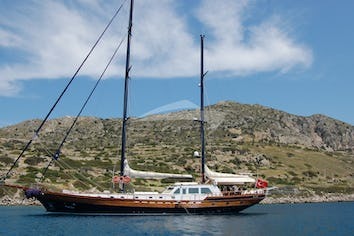 KAIROS is a 125 foot (38 m) 2-mast-schooner with a sail area of 568 sm. The finishings are done in teak and mahogany. On deck you will have plenty of space with deck chairs, benches and sun mattresses. 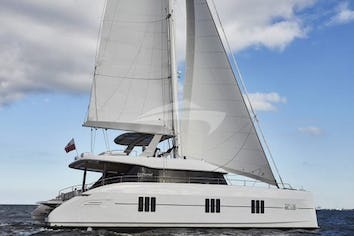 On the afterdeck up to 18 guests may enjoy their meal covered by a sunshade under the bimini. Below deck the large salon invites for meals, meetings, sitting and playing (board library, CD and DVD-player, TV screen for presentations available). Languages on board are English and German. KAIROS can offer six cabins in category A (app. 11 sqm with double bed 1,70 x 2,00 m, bath/WC with own shower cabin 90 x 90 cm) and three cabins in category B (app. 8 sqm, two of these with bunk bed, one with double bed, bath/WC with wet cell). 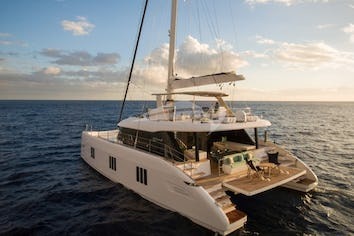 All cabins are air conditioned (individually adjustable) and named after classic yachts. All safety regulations for professional sailing vessels are on board: radar, EPIRB, sonar, SAT-telephone, NAVTEX and card plotters. The crew of six consists of: captain, engineer, bosun, chef and one or two people for the service. 30 guests for daysailing, approximately 50 guests for cocktails alongside quay. KAIROS is ideal for events with her enormous deck space and classic look.